This evening, join Mairi and fellow music lovers for a welcome briefing followed by a special welcome dinner. This morning, join Mairi for a pre-performance talk covering the following days’ performances. Then, become acquainted with the city of Bucharest with a walking tour of Calea Victoria street and the Old Town. Initially paved with oak beams when constructed in 1692 and flanked by some of Bucharest’s most important and beautiful buildings, Calea Victoria developed into one of the most fashionable streets in the city during the early 20th century, when Bucharest was dubbed the ‘Paris of the East’. The Old Town is a lively jumble of narrow streets lined with shops and restaurants, and a sprinkling of historic churches. After lunch at a local restaurant, enjoy some time at leisure. This evening, walk to the Grand Palace Hall for the opening performance of the 2019 George Ensecu Festival by the Berlin Philharmonic. Today, enjoy a morning chamber music concert by the Monte Piano Trio of works by George Enescu, Gabriel Fauré and French Romantic composer Ernest Chausson. Spend the early afternoon exploring Bucharest at your own pace, with a suggestion to visit the Romanian National Art Museum, founded in 1948 to house the former Royal Collection, which included Romanian and European art dating from the 15th to the 20th century. In the late afternoon, walk to the Romanian Athenaeum, Bucharest’s 19th century Neoclassical concert hall, for a recital by harpist Xavier de Maistre with soprano Diana Damrau, followed by a concert in the Grand Palace Hall by the Berlin Philharmonic. This afternoon, enjoy a vocal recital in the Romanian Athenaeum by mezzo-soprano Joice Didonato. In the evening, attend a performance of Shostakovich’s Symphony No. 6 in B minor by the London Symphony Orchestra, as well as Prokofiev’s Piano Concerto No. 2 in G minor with soloist Denis Matsuev. In the morning, visit Mogosoaia Palace, the summer residence of Wallachian prince Constantin Brancoveanu completed in 1702. Designed using a combination Ottoman, Byzantine, Renaissance and Baroque architectural elements, together known as the Romanian Renaissance style, the palace today is home to the Museum of Brancoveanu Art. Afterwards, enjoy lunch at a local restaurant. In the late afternoon, return to the Romanian Athenaeum for a concert by the Polish National Radio Orchestra and pianist Szymon Nehring, winner of the 2017 Arthur Rubinstein International Piano Competition, performing Witold Lutosławski’s Concerto for Orchestra and one of Chopin’s piano concertos. Afterwards, attend a performance of the London Symphony Orchestra with soprano Diana Damrau and tenor Cosmin Ifrim. This morning, enjoy a visit to Cotroceni Palace. Constructed in the late 19th century, it served as the residence for the Romanian royal family until 1939 and was later transformed into an official guesthouse for visiting heads of state during the Communist Era. Since 1991 it has been the official residence of the Romanian President, with the old wing of the palace now a museum. Return to the hotel in the early afternoon for time at leisure. Enjoy two performances this afternoon and evening beginning with the Polish National Radio Orchestra performing Bartók’s Bluebeard’s Castle, followed by a concert staging of Richard Strauss’s opera Die Frau ohne Schatten, performed by the Berlin Radio Symphony Orchestra with soloists including Thomas Mayer and Christine Goerke. Begin the day with a coach tour exploring life in Bucharest during the Communist Era. 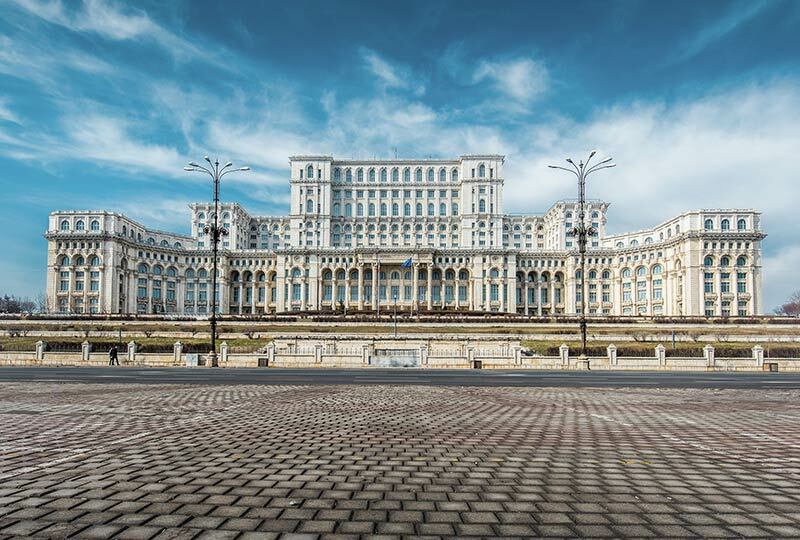 See the Palace of the Parliament, the world’s second-largest administrative building, built at the special request of Nicolae Ceausescu, leader of Romania’s Communist Party from 1965 to 1989. Then visit Casa Scanteii, a replica of the famous Lomonosov Moscow State University, built for the purpose of bringing together all of Bucharest’s official press and publishing houses under one roof, and Primaverii Palace, the home where Ceausescu and his wife Elena lived the last 25 years of their lives together. This evening, attend a performance by the Orchestra Pelleas with violinist Tasmin Little of Romantic and Impressionistic works by Enescu, Bizet, Debussy and Ravel, followed by a performance at the Grand Palace Hall by the Berlin Radio Symphony Orchestra with violinist Julia Fischer. The early afternoon is at leisure before a performance by the Cameristi della Scala, a chamber orchestra formed from the members of the Teatro alla Scala di Milano. Later, attend a performance by the Orchestre National de France of Mussorgsky’s Pictures at an Exhibition, followed by Liszt’s Piano Concerto No. 2 in A Major with Evgeny Kissin. Enjoy a morning recital by Canadian pianist Charles Richard Hamelin of works by Rachmaninoff, Debussy and Enescu. Enjoy an afternoon at leisure, with a suggestion to visit the Museum of the Romanian Peasant. Opened in 1906, the museum features the richest folk-art collection in Romania, with over 90,000 artefacts that trace the colourful and diverse cultural life of the Romanian people. This evening, attend a recital by violinist Julia Fischer, before a concert by the Orchestre National de France of Debussy’s final orchestral work Jeux, alongside Alberto Ginastera’s Concerto Argentina with pianist Alexandra Dariescu. Walk to the Grand Palace Hall for a morning performance of piano works by Enescu, Saint-Saëns and Ravel by pianist Grigor Ashmaryan. The remainder of the afternoon is at leisure before a late afternoon performance of Beethoven’s Piano Concerto No. 5 in E♭ Major, the Emperor Concerto, by Elisabetha Leonskaja with the Vienna Radio Orchestra, and an evening performance of Brahms’s Piano Concerto No. 2 in B♭ Major by Yuja Wang with the Staatskapelle Dresden. Begin the day with a talk by Mairi on the following days’ performances. Then, discover Romania’s rich religious heritage, visiting the Museum of the History of the Romanian Jewish Community, the Metropolitan Church and Patriarchate Hill, the site of a 17th century cathedral considered the centre of the Romanian Orthodox faith. Return to the hotel in the early afternoon for time at leisure. This evening’s first performance is of three cello sonatas by Enescu, Brahms and Franck performed by cellist Alexander Kniazev and pianist Plamena Mangova. Later, enjoy another performance by the Staatskapelle Dresden with soprano Kristine Opolais. After a morning at leisure, join Mairi and fellow travellers for a special farewell lunch. Enjoy a morning at leisure before celebrating the conclusion of the tour with a special farewell lunch with Mairi and fellow travellers. In the evening, enjoy a vocal recital by tenor Rolando Villazon at the Romanian Athenaeum followed by a final performance at the Grand Palace Hall of Tchaikovsky’s Piano Concerto No. 1 in B♭ minor by the Romanian National Youth Orchestra with world-renowned blind pianist Nobuyuki Tsujii. For those tour members joining the Treasures of Transylvania #1 post-tour, check out of the hotel in the morning and depart for Transylvania. For those not joining the Treasures of Transylvania #1 post-tour, check out of the hotel after breakfast and transfer to Bucharest Airport (transfer included in tour price), where tour arrangements conclude. Suggested flights on Qatar Airways to Australia or New Zealand via Doha. Renaissance Tours or your travel agent can assist you with your flights and other travel arrangements, including any additional nights’ accommodation, either before or after the tour.